Congratulations, Lentil, mnhenkins, Jill Myrick (jsc123), jbmthill and Romapr! Thanks to everyone who entered these great giveaways! Happy Holidays and Happy New Year! In what seems like the blink of an eye, 2012 is here. What happened to 2011? Or 2010 for that matter? Heck, it probably wouldn't take all that much to convince me that it's not 1997 (I'm pretty sure that I've seen some side ponytails and spandex lately, so at least that would be a good explanation). In what is an age-old tradition, people everywhere are pinpointing the areas of their life that they want to make changes... new year, new you, right? From losing weight to quitting smoking to getting organized, we all have aspects that we would like to improve on, no matter how much we try to avoid them or not. But... even if we make resolutions, have you ever thought about the deep down truth behind them? Sure you want to lose weight so that you'll be healthier, but is there also the tiny part of you that wants to see the look on your ex's face when you flaunt your new bod? Enter Tropicana Trop50 True Resolutions, a fun way to make a real resolution along with the revolution of the truth behind it! In 2012 I want to lose weight to not be asked when I'm due (he's 3). In 2012 I want to get organized to create a more efficient way to slack off. Along with sharing your motivation (publicly or anonymously with a fun disguise), you'll also earn a coupon for $1 off of Trop50 for yourself and 50¢ off coupons for up to 50 of your friends. 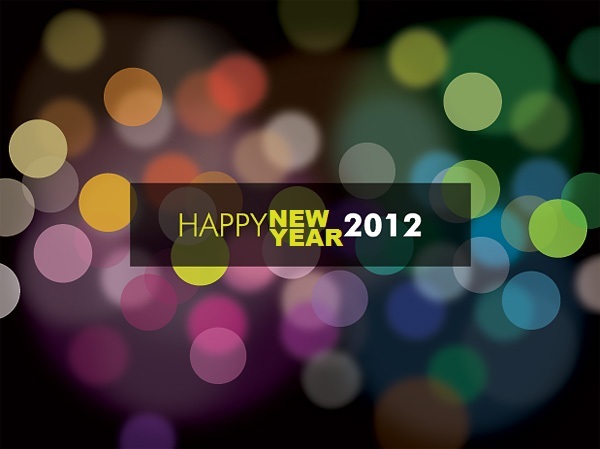 Even better, whether you submit a resolution or not, you can also enter Trop50's sweepstakes to win a $1000 gift card! Talk about filling your New Year with goodness! Or, for a surefire way to bring home some goodness, have you tried a bottle of Tropicana Trop50 already? Delivering the benefits of fruit juice with 50% less sugar and calories and no artificial sweeteners, this is one juice beverage that hits the spot! Available in what seems like an endless number of delicious flavors, we've tried and enjoyed the Trop50 Orange and Farmstand Apple varieties in the past. This time when I was at the store, my eye caught on their newest additions, Lemonade and Raspberry Lemonade, and I knew we had to give one a go! Yum! 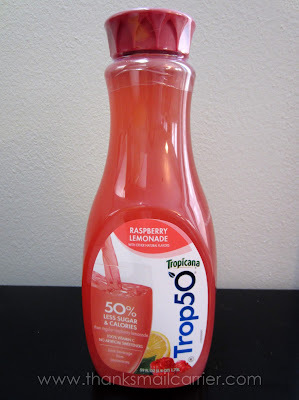 Trop50 Raspberry Lemonade delivers the refreshment of the tangy sweet taste and its reduced calories isn't the only thing that makes me love it even more. It also provides 100% of my day's Vitamin C and is a good source of Vitamin E in every 8-ounce glass. Start off your New Year by being inspired by Trop50 and their fun resolutions and delicious juice beverages! No need to sugarcoat the truth behind your resolution or your next glass to drink, instead head over to participate on their Facebook page (and enter to win $1000!) and then keep an eye out at your local retailer for all of the varieties of Trop50. 1 Extra Entry (per method) if you Like Tropicana Trop50 on Facebook and/or follow them on Twitter. Giveaway will end on January 20th at 11:59pm CST. By entering this sweepstakes, you are agreeing to these official rules. No purchase necessary, void where prohibited by law. Do me the favor of leaving an email address or making absolutely sure it is visible in your profile, I have to have a way to contact the winner. 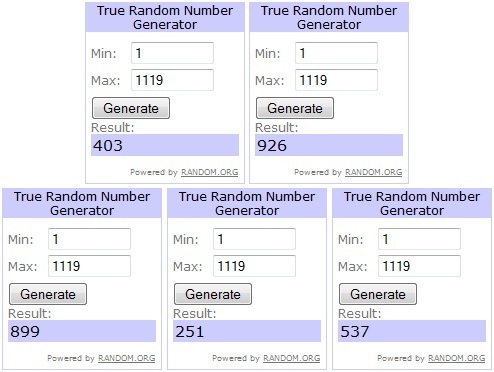 The winner will be chosen by random.org and announced here as well as emailed and will have 48 hours to contact me or respond to notification or a new winner will be chosen. 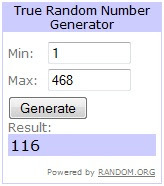 The number of eligible entries received determines the odds of winning. This giveaway is open to U.S. residents only and must be 18 years of age or older. 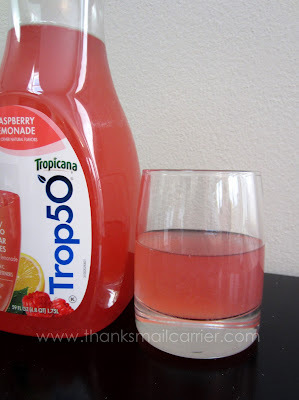 A big thank you to Tropicana Trop50 for providing a sample and gift card for me to review as well as for one lucky giveaway winner. The opinions shared are my own and honest and if you really need to see more, click here to see how I roll. Welcome to Friendly Friday... the last one. It has been 19 months since Christi at Frugal Novice, Charla at Healthy Home Blog and I teamed up to introduce Friendly Friday and, by my count, we have posted this weekly way to make more friends, get more blog followers and follow other great blogs a whopping 80 times. Each week we have loved seeing new and returning names join our celebration and add their link to the list. Getting to visit blogs from nearly every niche out there introduced us to writers, chefs, mothers, travelers, bargain-hunters, reviewers, designers, and many more that we otherwise might not have had the chance to meet, and we will be forever thankful for that opportunity. However, as all good things must come to an end (and with the news that Google Friend Connect won't be available on WordPress blogs in the future), we have decided to not continue Friendly Friday in 2012 and therefore have this be our last week. Whether you linked up every week, casually or this is your first visit, we appreciate you taking the time to join us. We truly have enjoyed getting to know you and hope that you have benefited and felt supported from being a part of this virtual gathering as well. We raise our glass to you and wish you the best of luck with your blog and in the future! Please add your family-friendly link below and join us for our last Friendly Friday! Thank you for participating! I can't remember the last time I walked through a mall and didn't see a variety of Apple gadgets everywhere I looked. From the iPhones to the iPads, it's hard to deny that these are the products of choice when it comes to staying connected in our digital world. But if you felt the same way about seeing Apple devices everywhere before the holidays, be prepared for an even bigger surge in them now! According to a few articles I've seen, the iPhone 4S rolled out globally faster than any previous iPhone and sales have been through the roof, while the iPad was very likely the most asked for gift this holiday season. So now that there are millions of new and veteran Apple owners, what are they doing with their purchases? 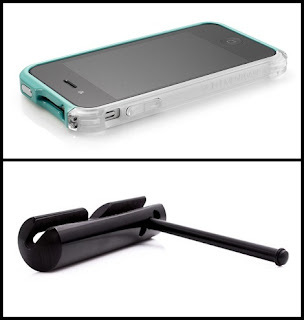 As well as figuring out all of the ins and outs of using them, it's time to add some much-needed accessories and protection so that the happiness of owning an iPhone or iPad doesn't immediately turn to sadness if it is dropped, stepped on or turned into a chew toy by a rambunctious puppy. And the name that knows all that there is about high quality, functional, stylish cases for our beloved Apple items? 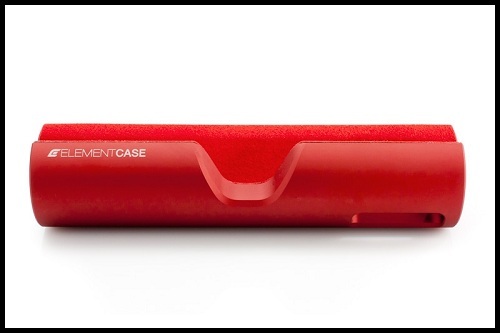 Element Case. Started in 2008 with the creation of their first ultimate iPhone protective case, Element Case has been making luxury accessories for the iPhone and iPad ever since. With a growing staff of highly talented designers, customer service reps, and business minds, this company continues on in their dedication to creating high end, beautifully crafted products made in the USA that are known and talked about throughout the world. ...these slim, compact cases are made to ensure that your iPhone has all of the protection it needs in the non-slip, ergonomic, stylish designs that you prefer. Things like the high-shock absorption polymer construction and carbon fiber reinforced back plates mean that no matter if your phone gets tossed around in your purse or accidentally pushed off of the end of the table, it will be safe and secure. 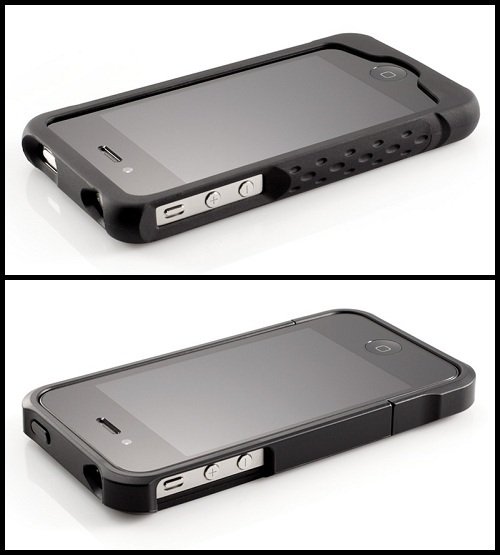 The next step up, the Vapor COMP series of iPhone cases prevent loss in signal, while their aluminum frames are enhanced with extra rubber grip on the sides for a better feel and ergonomics. 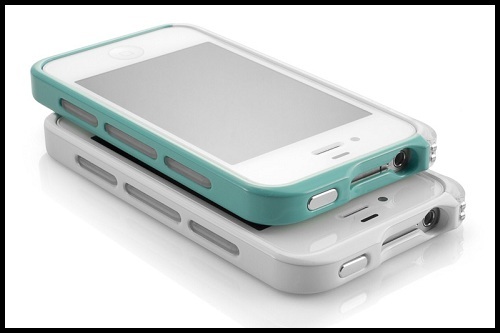 Starting at $99.99, these cases provide a timelessly classic look with the rock solid protection that you need. Finally, Element Case's Vapor Pro collection is made up of the most rugged, lightweight, and versatile iPhone cases that they have ever made. Slightly taller than the Vapor COMP for greater impact protection, the Pro also includes larger connector cut outs, a huge variety of colors to choose from and a total weight of only 22 grams. These top of the line cases start at $129.99 and are a great investment for an item that you are going to use and depend on day after day. While already having carved out their corner of the iPhone case market, the arrival of the iPad meant that the Element Case designers wanted to create an equally innovative accessory for it. And, with the introduction of the iPad Joule, users have been thrilled with the results. Featuring a solid stable base with a simple, clean, and elegant design, the Joule enhances the look of the iPad while making it easier to use. 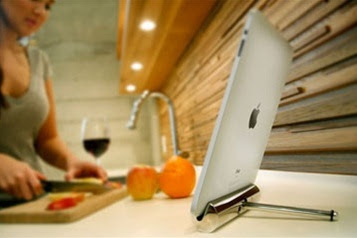 Unlike most stands, this one won't tip over when using the iPad's touch screen which allows the iPad to be better utilized on a desk or kitchen counter top. The magnetically attached tilt foot allows for quick and easy view angle adjustments and the soft lining keeps the iPad or iPad2 securely in place. Available in black, polished silver or a variety of bright colors, the Joule has quickly become a must-have accessory for iPad users everywhere. 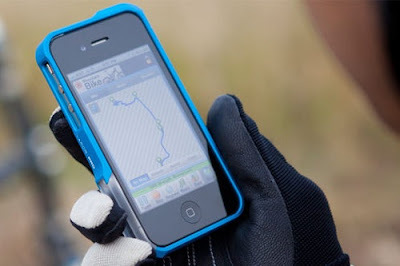 If you or someone you know is starting off 2012 with an iPhone or iPad, be sure to head over to Element Case to learn much more about their great products. From cases to stands to accessories galore, it is no wonder that so many consumers have been thrilled with their purchase and the knowledge that their Apple device is prepared for the ups and downs of everyday life. One lucky person will win a White Vapor COMP Epiphany iPhone case (in their choice of white or blue) AND a Joule iPad stand (in their choice of black or silver)*! Total ARV $220! 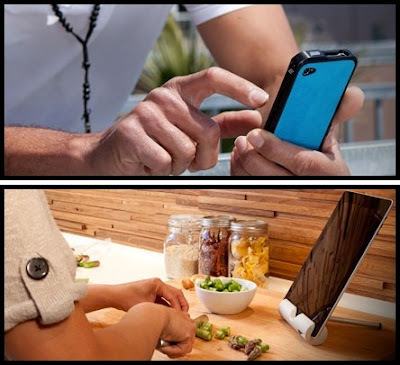 *This iPhone case is designed to work with any iPhone 4 or 4S on ANY carrier, while the iPad stand works with the original iPad as well as the iPad2. To enter to win: Visit Element Case and leave a comment telling me which product there you would most like to own or give as a gift. 1 Extra Entry (per method) if you Like Element Case on Facebook and/or follow them on Twitter. Giveaway will end on January 13th at 11:59pm CST. By entering this sweepstakes, you are agreeing to these official rules. No purchase necessary, void where prohibited by law. Do me the favor of leaving an email address or making absolutely sure it is visible in your profile, I have to have a way to contact the winner. 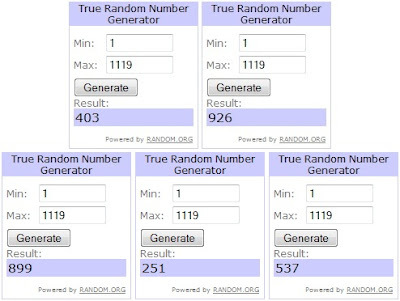 The winner will be chosen by random.org and announced here as well as emailed and will have 48 hours to contact me or respond to notification or a new winner will be chosen. The number of eligible entries received determines the odds of winning. This giveaway is open to U.S. residents only and must be 18 years of age or older. 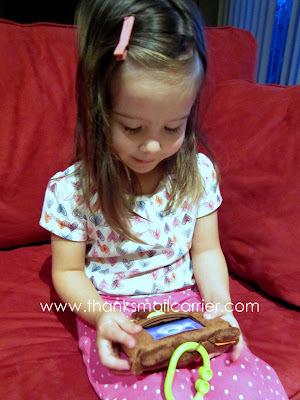 A big thank you to Element Case for providing a case and stand for me as for one lucky giveaway winner. The opinions shared are my own and honest and if you really need to see more, click here to see how I roll. While planning our recent kitchen remodel, I was beyond excited when our contractor mentioned to my husband and I that he had found a way to move our washer and dryer from our dark, cold basement up to our second floor (where our bedrooms are located). Did we want that added to the plans? Are you kidding? ADD THAT TO THE PLANS! Because as much as I don't mind doing laundry itself, the process of gathering all the clothes and lugging them down two flights of stairs... only to have to then carry them back up two flights of stairs, well, it's not my favorite. 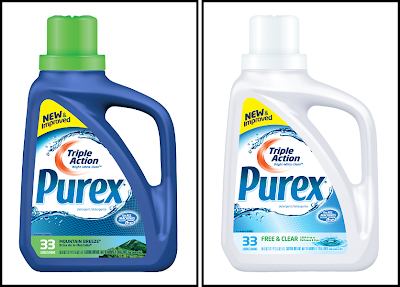 Fortunately, on top of the thrilling news of having my washer and dryer easily accessible, Purex has also come out with a way to get our clothes bright, white and clean with their newest laundry detergent: Purex Triple Action. 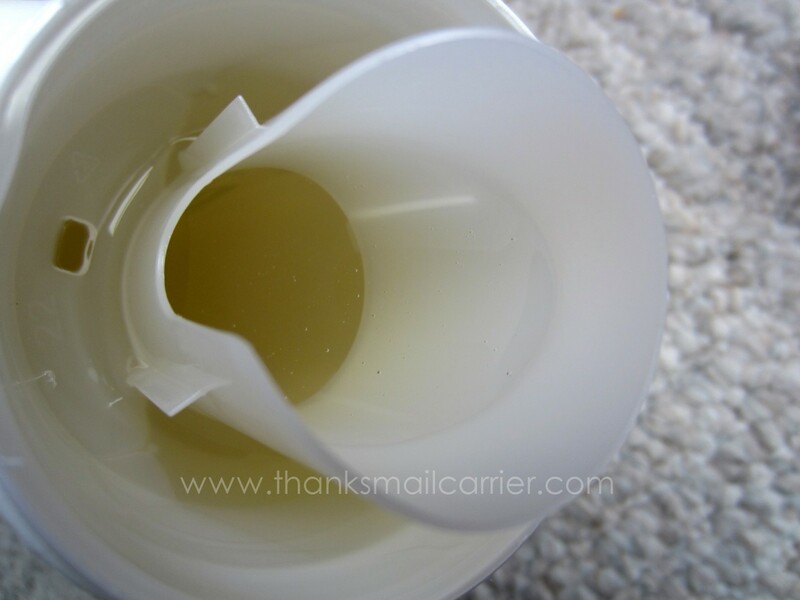 After a year of research and development, Purex has created an even better formula to add to their line of high quality and affordable liquid detergents. While still fulfilling their promise of providing exceptionally clean clothes at half the price of the leading brand, the new Purex Triple Action is another example of this company staying mindful of their consumers' pocketbooks. Why not purchase a great product at a great value? 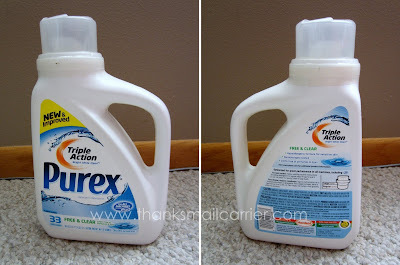 Having heard that Purex Triple Action combined the best parts of their current formula with new additions to deliver better cleaning and improved brightening powder, I was interested in checking out the difference that this detergent could make for us. As Purex Triple Action is specifically formulated to work in both traditional and High Efficiency washers (the latter being what we have), right away when I pulled out this bottle I was appreciative that Purex is one detergent that works for everyone. ...I also love the way that Purex makes it possible to choose the one that works for you and your family, whether that be Mountain Breeze, Free & Clear or any of the other great options. ...and just knowing that it costs so much less than the competition makes me enjoy it even more! As with our past experiences with Purex, I'm left happy knowing that consumers don't always have to spend more money to achieve quality results. I'm looking forward to using Purex's current products for now, while also anticipating that they will continue to come out with more innovative changes in the upcoming year. Keep an eye out for Purex Triple Action formulas at your local retailer and find out more on their website, as well as on Facebook and Twitter. There are quite a few aspects of living in a cold-weather climate that I'm not too happy about, namely... well, the cold. But one of the frustrating side effects that goes along with it is the amount of time it typically takes to get out the front door. Instead of slipping our feet into sandals and being ready to go, we can spend upwards of 10 minutes finding and putting on every last pair of snow pants, boots, and more. However, since the day that we were introduced to Vs. Mittens, suddenly things changed. 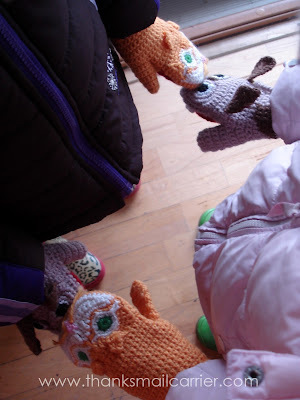 Instead of the slow dawdle, I have to admit that the kids aren't the only ones who are excited about finding any chance that we can get to hurriedly pull on our unique, creative and extremely fun mittens. When they look like this, who can resist? From the zany creators of Hoopla, a product development and gift company based out of New York, Vs. Mittens were originally invented for adults who are actually kids on the inside. Who wants to wear yet another pair of boring gloves or mittens when you can wear something that combines function with an eye-catching, quirky style? Just from the photos on their website of these predator and prey pairs, I had no doubt that the kids and I were going to have fun with our Vs. Mittens... but then they arrived and it was downright love at first sight. 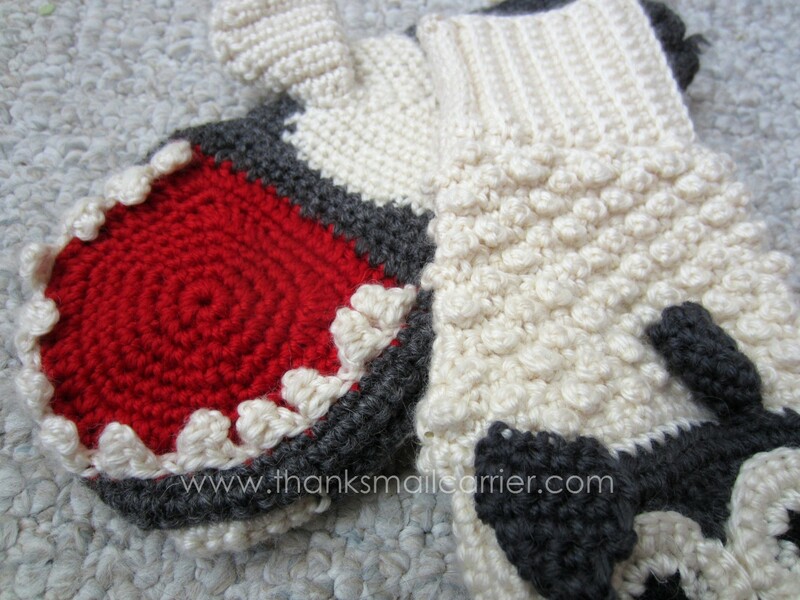 As well as being absolutely adorable, these mittens are ethically handmade sweatshop free in China by local crocheting farm lades in their off-season. Seeing them in person immediately made me smile, while also putting me a little bit in awe of all of the great detailing. From the floppy ears to the individual teeth to each little bump of the sheep's wool - they really are amazing! Big Sister E and Little Sister B received mittens from the Juniors line, which includes Bird vs. Bee, Cat vs. Dog, and Frog vs. Fly... and their eyes lit up when they saw the cuteness. This cat and dog are just so much fun! While the intent is that this territorial cat and cat-chasing dog are classic rivals, my girls have had endless entertainment putting their furry pals through various tales and adventures. 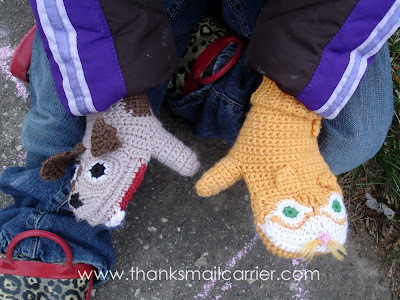 There isn't much that Vs. Mittens can't make more fun, as running errands, raking leaves or simply sitting in the car is cool if you have these with you. Although I wasn't surprised by the awesome appearance, after having let the girls wear these mittens for quite a while, I'm very happy to see the great quality as well as how thick and warm they are outdoors. The 80/20 wool/acrylic mix and the excellent crochet really does keep the cold out and the warmth in. While I'm typically left a little jealous of my kids' cute items, I think I am just as excited about my Wolf vs. Sheep adult mittens! 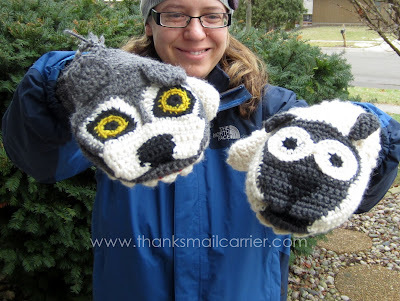 Made from the same high quality as my kids' Cat vs. Dog pairs, these keep my hands toasty warm while also entertaining my kids as we wait in line at the store, to be called in for an appointment or while sitting at a stoplight. Really, it's like having a pair of our favorite puppets with us at all times! 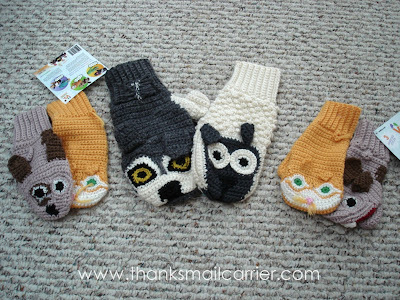 Retailing for $24.99 for kids (Vs. Mittens recommends ages 4 - 7 but these have fit Little Sister B perfectly even when she was a month shy of 3) and $29.99 for adults, we haven't met a single person who hasn't been amazed at our Vs. Mittens. An absolute conversation starter, everyone we have come in contact with has examined them (after picking their jaw back up) and loves the idea just as much as we do. After I admit that no, I did not make them myself (who do these people think I am that I would be that talented?) we continue to agree that these are just that cool! With so much winter still to come, a pair of Vs. Mittens are just the thing that the adults and kids in your life need to brighten their time outside. Visit their website to see and order all of their awesome designs and connect with them on Facebook and Twitter as well. When I was a kid, I remember that wanting to be grown up was all about being allowed to wear makeup or talk on the phone to boys. Kids these days? I'm sure that makeup and boys rank right up there in importance, but there's a new heavy-hitter in town: technology. With how savvy kids are with computers, tablets and phones in 2011, I sometimes worry about my girls growing up too quickly. What happened to just wanting to play with dolls? 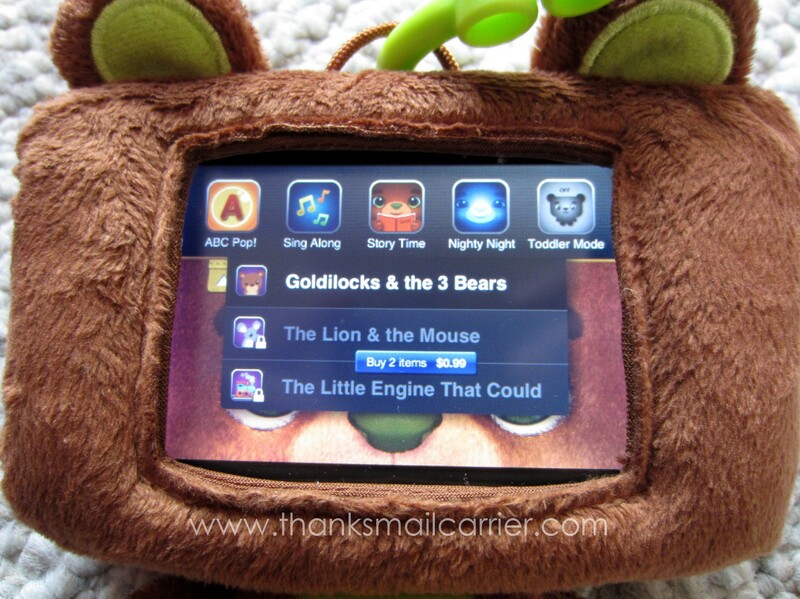 Or your most cherished item being a stuffed animal and not something that requires batteries or apps? 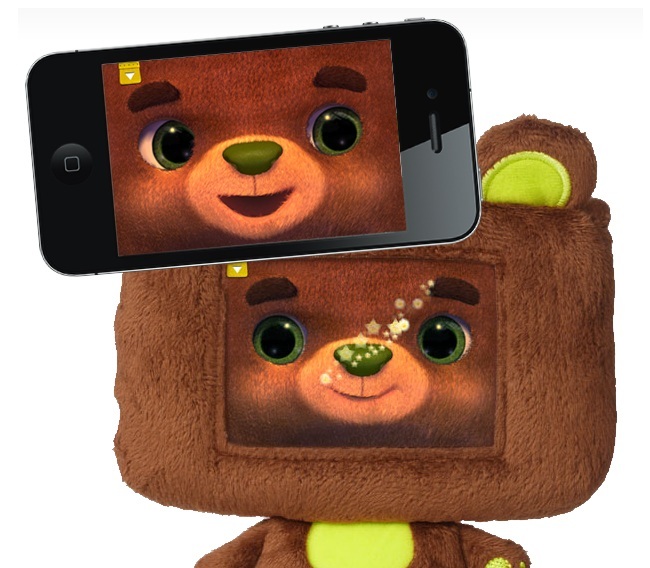 Well, thanks to the well-known baby brand Infantino teaming up with the publisher Tipitab, there is now a new, innovative toy on the market that combines a child's favorite plush pal with a first-of-its-kind, interactive, 21st century twist. Introducing HappiTaps. A toy/app hybrid, HappiTaps is a combination of a lovable teddy bear friend and a huggable cover for your iPhone or iPod touch. 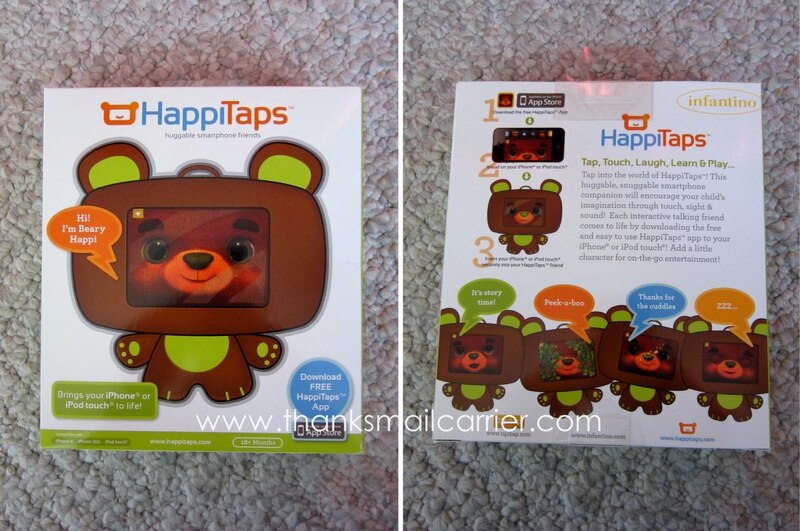 By purchasing the HappiTaps case and downloading the free app from the app store, your child's love of touchscreen devices can now extend to an adorable, lovable companion... that comes to life! 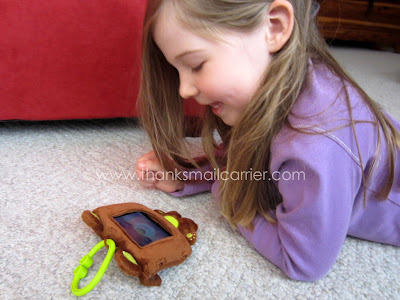 Knowing that there wasn't going to be much more that Big Sister E and Little Sister B would enjoy than an animated friend to play and educate them, when our HappiTaps case arrived, I was eager to check out just how easy it would be for them to utilize. Thankfully, I was able to find that it barely takes any time at all to transform an electronic device into an extremely fun (and very cute!) toy for kids to enjoy. After downloading the free app, I easily slid my iPod touch right inside and with a tap or two on the screen, Beary Happi came to life. Oh, the cuteness! From the moment I introduced the girls to Beary Happi, it was apparent that I was never going to get my iPod touch back from them again... but, considering the joy that they've received from him, I'm okay with that. Watching him come to life like they've never experienced in a plush toy before, they've adored nurturing, feeding, talking, joking, singing and more with Beary. Whether they are helping him go to sleep or sharing fun facts and stories, their cuddly pal manages to keep them engaged while also throwing in some learning at the same time. Although I was initially concerned that Beary wouldn't do quite enough to keep my kids' attention for a long period of time, I was happy to find that I was mistaken (although Big Sister E, at 5, does tend to play with him less than Little Sister B, age 3). 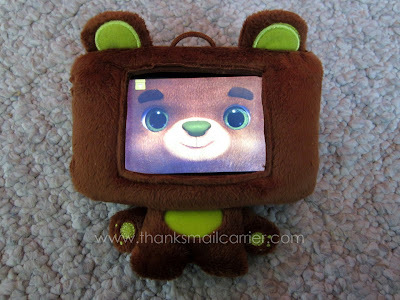 As he comes programmed with over 150 different expressions and various songs, games and stories, each time we turn Beary on leads to a different experience. Plus, this app uses more than just audio and video to engage with young learners and employs motion sensors and gyroscopes to create a more lifelike, realistic experience. Beary isn't just a computer, he really reacts to you and makes you feel as though your beloved teddy bear really has come to life. With the convenient hook at the top, Beary can easily be clipped onto a car seat, bag or more and I appreciate that the HappiTaps case itself protects my iPod touch from any dings or dents when being carried around or while during play. If there is ever a time that I am out running errands with one of my kids and I know that there might be a wait, I'm sure to bring Beary along as the perfect boredom buster! 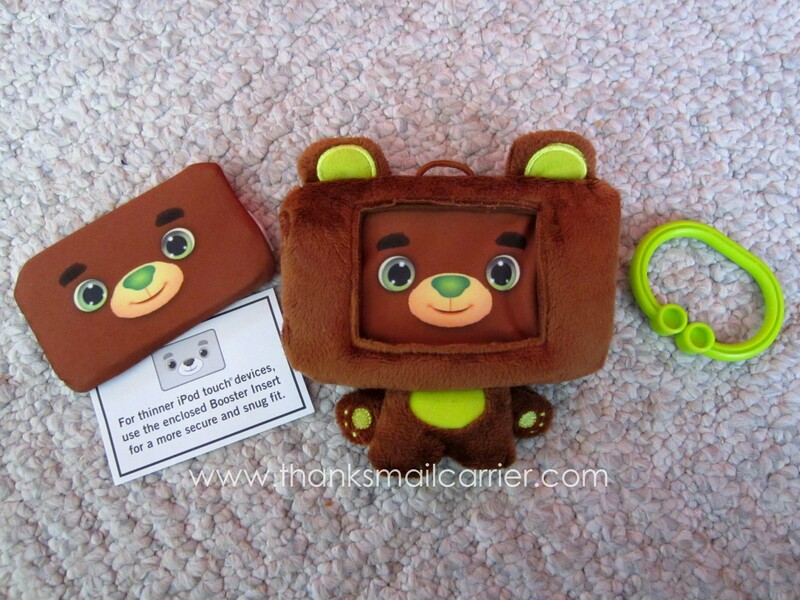 Retailing for $19.99, the Beary Happi HappiTaps case is a great investment for parents everywhere that want to allow their children to have fun with their electronic gadget. The main thing that I would like to change is the ease in which my kids could accidentally purchase additional stories or games. With the 99¢ accessories available with a simple two taps on the screen, I wish that it was more difficult and less accessible for kids. For more information, please visit HappiTaps online as well as on Facebook and Twitter. I'm looking forward to seeing how this app changes and grows as it updates in the future! 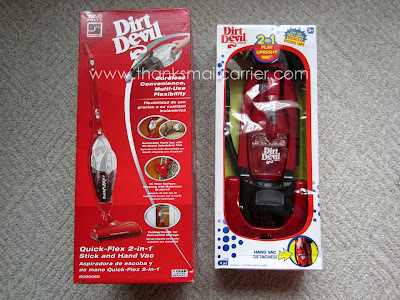 Dirt Devil Review: 2-in-1 Hand Vacuums for Adults and Kids! A dear friend emailed me a few weeks ago with news about the must-have, write-to-Santa, top-of-her-list item that her 3-year-old daughter wanted for Christmas. An electronic gadget? A singing, dancing doll? Items for pretend play? No, no, and... not exactly. 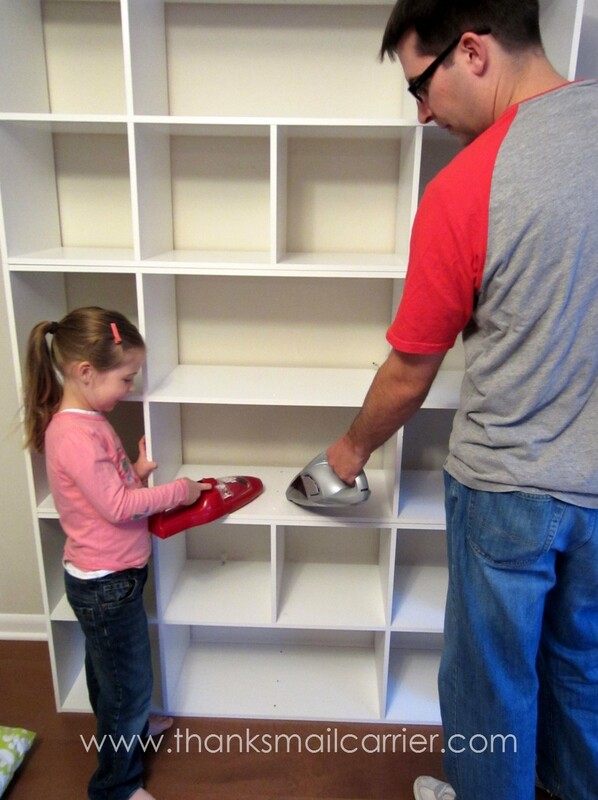 See, she didn't want to pretend to clean the house for Mom and Dad, she wanted to really do it. 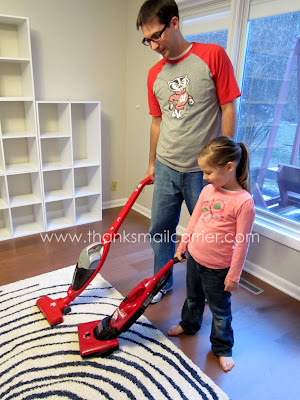 Therefore, she wrote to the Big Guy and asked for her dream gift: a steam mop. I tell you, that's my kind of kid. Unfortunately, my girls aren't quite as into cleaning, so I'm not counting on them doing anything like this in the near future. On the other hand, they do like helping and they have been known to volunteer to participate if they have a tool that is their size. So how can cleaning be made fun for all of us? 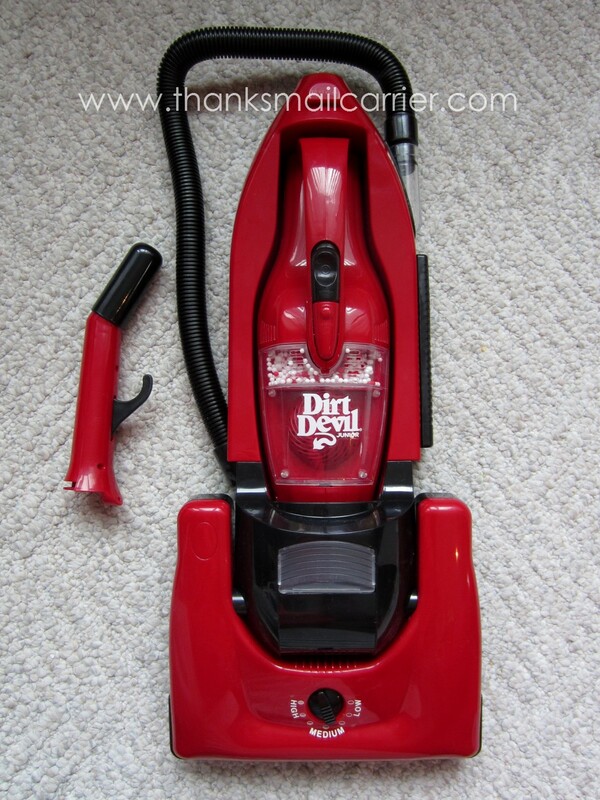 Thanks to Dirt Devil and the Dirt Devil Quick Flex 2-in-1 Hand Vac and the Dirt Devil 2-In-1 Play Upright Vac, we're all able to get in on helping keep our house clean... while having a good time doing it! Almost a little difficult to tell which one is the toy, isn't it? Committed to developing innovative cleaning solutions their customers value and trust, Dirt Devil has been providing reliable and high quality products since 1983. As well as their cleaning products that adults have known and employed for years, this holiday season Dirt Devil has launched a line of toy vacuums to be sold at leading retailers. Designed to imitate adult products, the toys feature the famed Dirt Devil red styling that are sure to be eye-catching for young and old. But more than just a toy to push around, these adorable mini vacuums have lifelike features such as realistic motor sounds, light-up buttons and actual pick-up capabilities. How cool is that? Retailing for under $25, I can easily see why a Dirt Devil play vac would be a guaranteed hit for the little one (ages 3+) who always wants to lend a helping hand around the house. Hoping that using a toy vacuum that mirrored one for adults would encourage my own kids to do more cleaning around the house, I couldn't wait to see how much of a hit the Quick Flex 2-in-1 Hand Vac and the 2-in-1 Play Upright Vac would be for all of us. Dirt Devil's Quick Flex 2-in-1 has 12 Volts of power and a motorized brushroll that works for quick pickups on multiple surfaces. 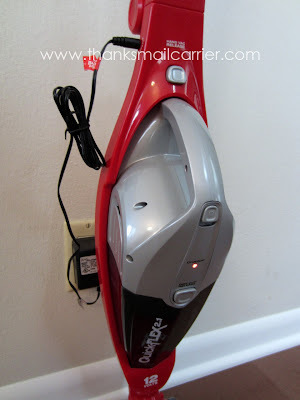 As we recently had hardwood floors installed in nearly all of the first floor of our house, I was immediately excited about being able to use this vacuum on any area rugs as well as right on the wood itself. As I began to pull it out of the box, I hesitated thinking that I should have gotten tools out. 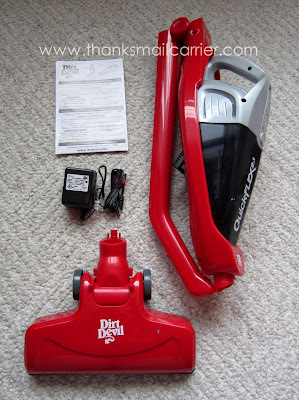 However, I was instead happy to see that Dirt Devil made it possible to go from box to vacuuming in barely any time at all. 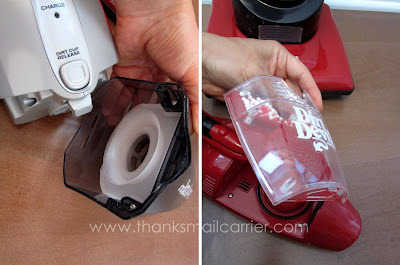 In less than a minute, I had the handle unfolded, the base snapped into place, and the battery charging up (I love the red light that shows me that charging is taking place) for use. Couldn't have been easier! While the Quick Flex charged, I turned to the 2-in-1 Play Upright Vac and found that the assembly was just as easy (if not easier) as the adult version. After attaching the handle and inserting 3 C batteries (not included), it was time to put both of these great vacuums to the test. 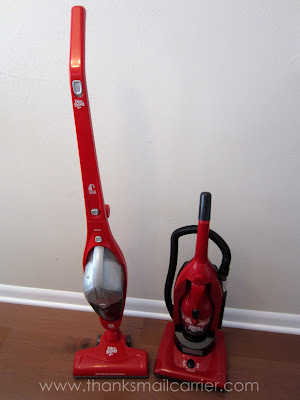 With quite a few similarities between these two vacuums, it was easy to see that my kids were going to love being able to have something just like Mom and Dad. ...and the hand vac lifts right off. A built-in crevice tool pulls out of the Quick Flex hand vac to reach deep down nooks and crannies and a dusting brush attachment is great for upholstery and textured surfaces. As for the Play vac? Well, it has beads that whirl around and very light suction that can really pick up! By clicking the hand vacs back into place, it is easy to push both the Quick Flex and the Play Upright throughout the house for cleaning quick messes whenever necessary. 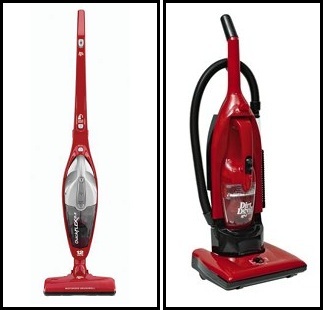 Even better, emptying both vacs doesn't take more than a push of a button as well, as each dirt canister easily releases and can be shaken out right into the trash can. 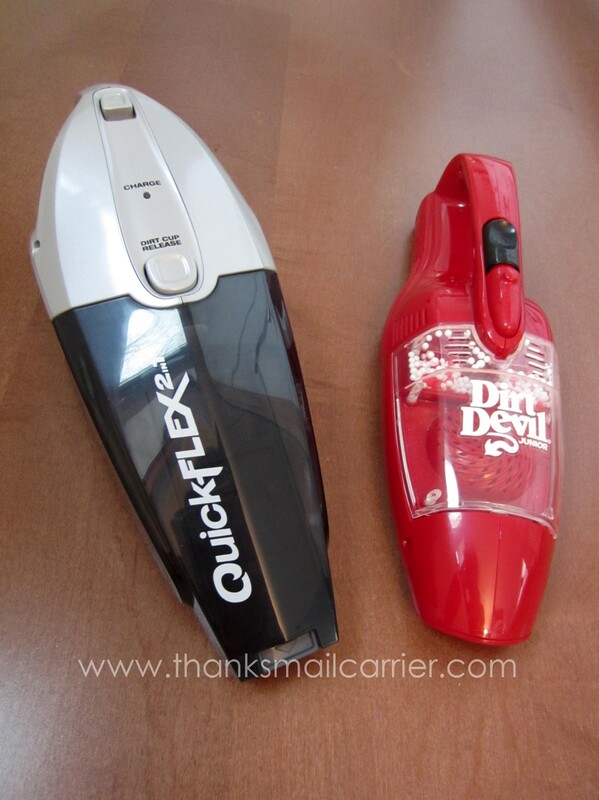 Retailing for $49.99, the Quick Flex 2-in-1 Hand Vac is currently out of stock from Dirt Devil, but is available on Amazon for slightly less and with free shipping. 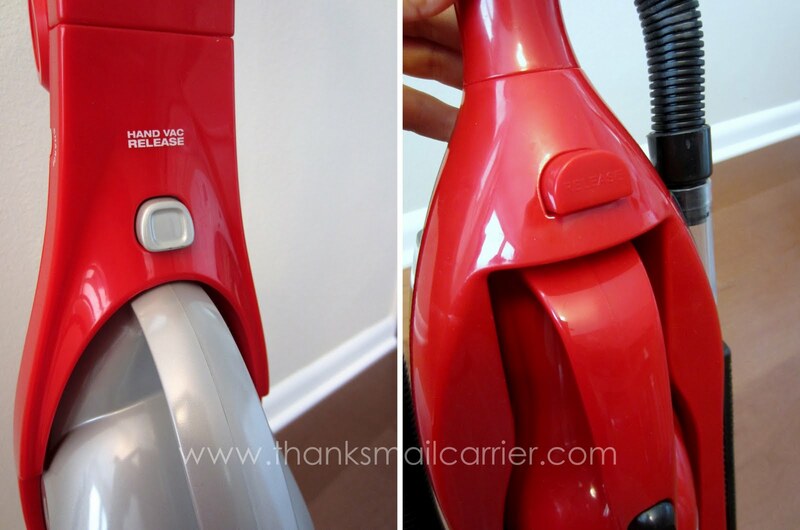 I love the simplicity of use and lightweight feel, not to mention the fold down handle for easy storage... and how great it is alongside the Dirt Devil 2-in-1 Play Upright Vac! This super fun toy has an MSRP of $19.99 at Walmart (I'm unable to find it on their website and only see it on Amazon) and really will thrill kids with its scaled-down similarities to the Quick Flex. Together, the two make great holiday gifts or just a unique way to kick off the New Year and a resolution to keep the house cleaner - this way the whole family can get involved! The sound of the waves is all I want to hear. Going From Now to Wow with Slim-Fast! Our New Holiday Tradition: Elf Magic!